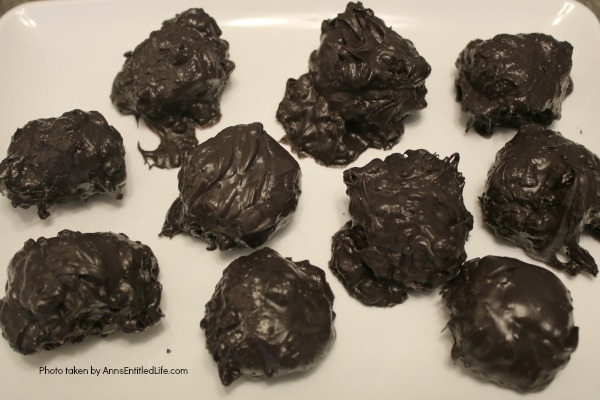 This no-bake, easy to make peanut butter lump of coal cookie recipe is a fun update to traditional lump of coal cookies. These peanut butter cookies are soft, moist, delicious, and only 4-Ingredients! 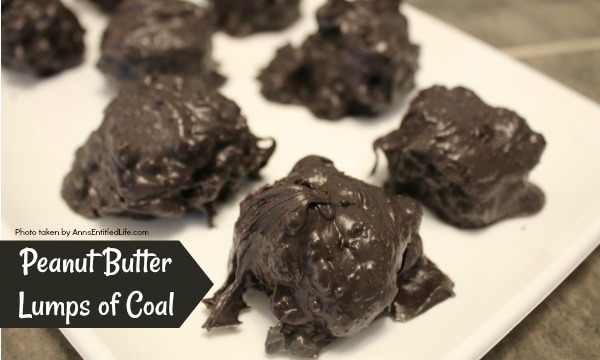 I expected nothing from this recipe when my niece told me we were making these lumps of coal. Boy, was I pleasantly surprised! Not only were these simple to make, they ended up nice and soft and really tasty! • These are lumps of coal, so the less uniform, the better. In other words, do not roll these into a uniform ball. 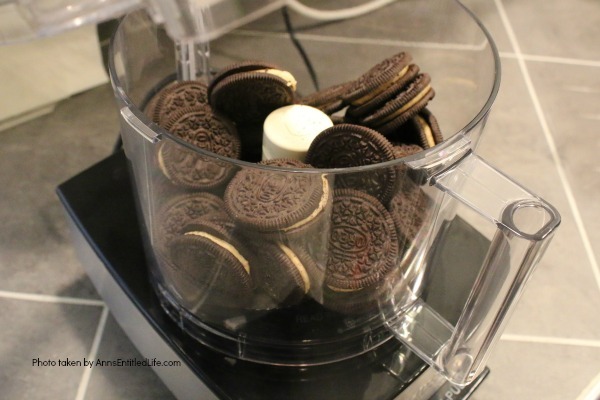 • Tip: set the dough in the fridge or freezer for 5 minutes to set. However, you will need to work very quickly with your chocolate on a chilled dough. 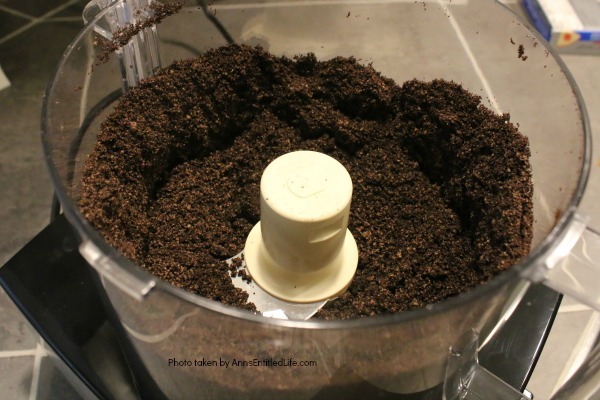 • Another tip: if your chocolate melts are not smoothing out as you would like, add a touch of vegetable oil and heat again (this would be the third round). • Note: You will be tempted to put these in the fridge to dry. Don’t do it. You could get a funky white color on the chocolate candy. 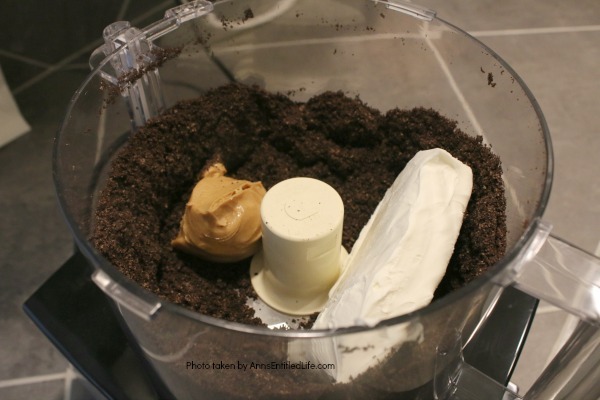 • Pulse peanut butter chocolate sandwich cookies in food processor until crumbs. 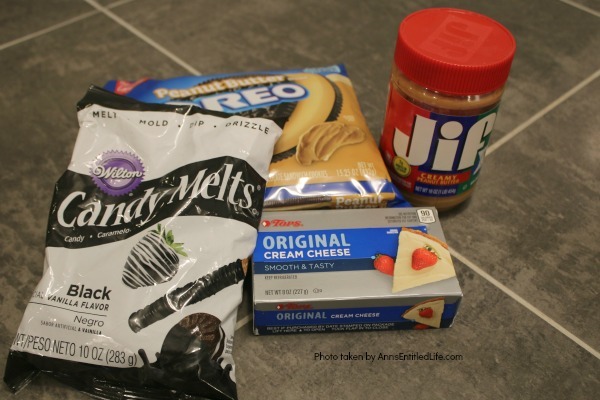 • Add peanut butter and cream cheese to the chocolate peanut butter cookies; pulse until combined (it should look like a pie crust dough). 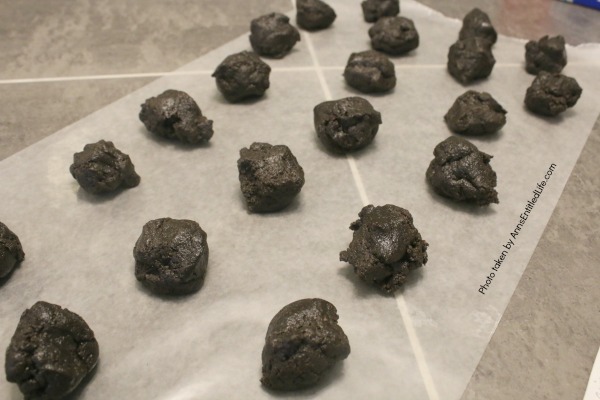 • Drop dough by tablespoonfuls onto wax paper. 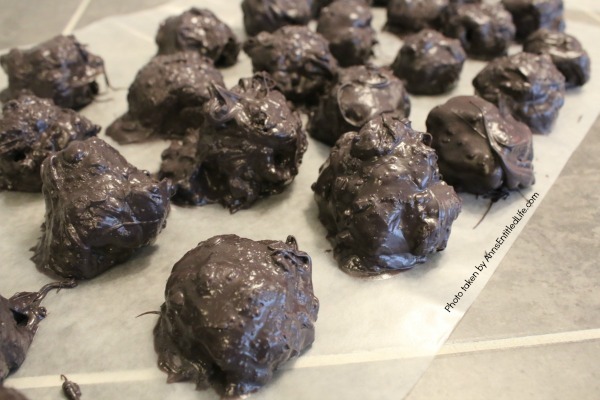 These are not to be uniform (they are lumps of coal), so do NOT roll into a uniform ball. 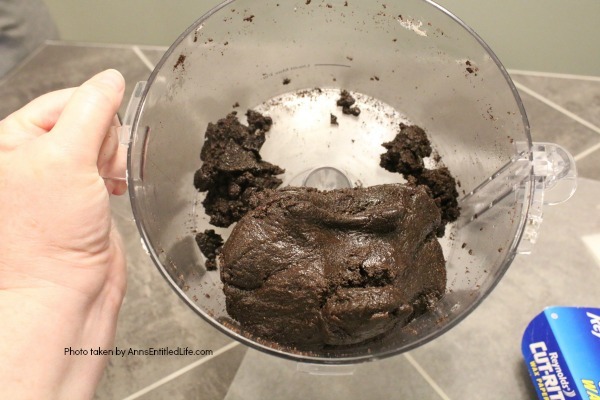 • Place a cup of black chocolate melts into a bowl. Heat in the microwave for 30 seconds, stir. Heat in microwave for another 30 seconds; stir. Repeat a third time. Check the consistency of your chocolate. If smooth, do not heat further. If it still does not stir and drips smoothly heat one more time. 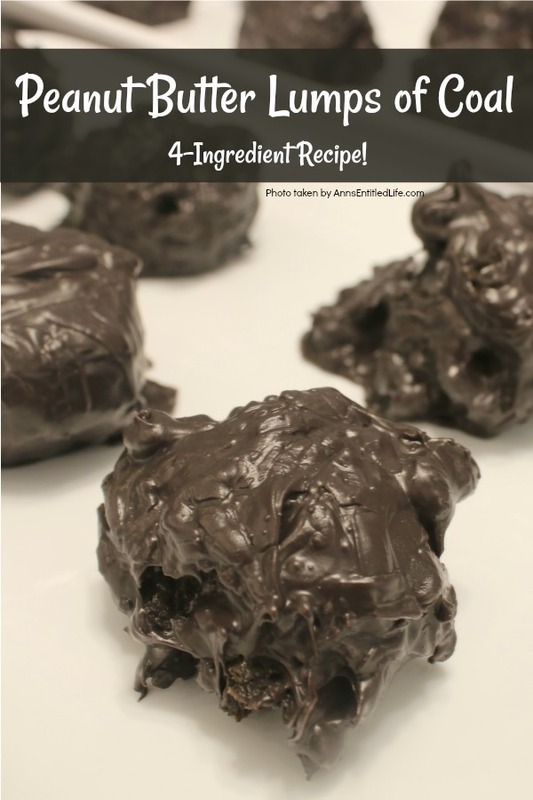 • Drop the chocolate lump into the melted black chocolate. Use a fork to remove the cookies from the chocolate. 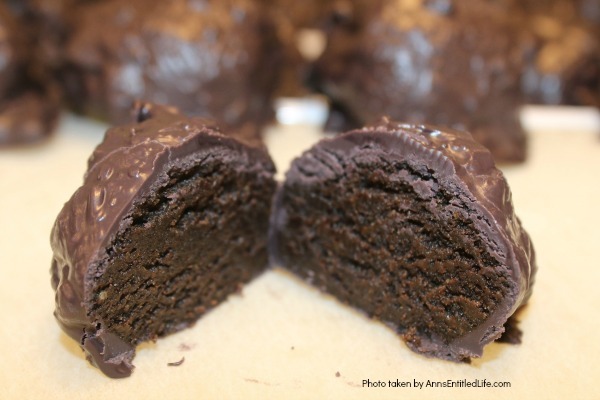 • Bounce the fork against the bowl to remove excess black chocolate. • Place on a clean sheet of wax paper. 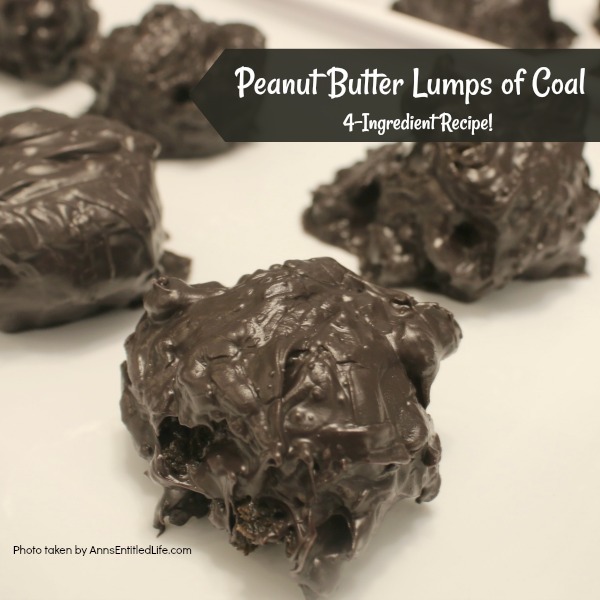 • To print the Peanut Butter Lumps of Coal recipe click here.